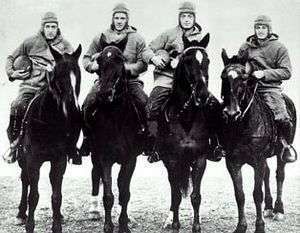 The Four Horsemen of Notre Dame comprised a winning group of American football players at the University of Notre Dame under coach Knute Rockne. They were the backfield of Notre Dame's 1924 football team. The players that made up this group were Harry Stuhldreher, Don Miller, Jim Crowley, and Elmer Layden. In 1924, a nickname coined by sportswriter Grantland Rice and the actions of a student publicity aide transformed the Notre Dame backfield of Stuhldreher, Crowley, Miller, and Layden into the most fabled quartet in college football history, the Four Horsemen of Notre Dame. After that win over Army, Notre Dame's third straight victory of the young season, the Irish were rarely threatened the rest of the year. A 27–10 win over Stanford in the 1925 Rose Bowl gave Rockne and Notre Dame the national championship and a 10–0 record. As it usually is with legends, the Four Horsemen earned their spot in gridiron history. Although none of the four stood taller than six feet or weighed more than 162 pounds, they played 30 games as a unit and only lost to one team, Nebraska, twice. They played at a time when there were no separate offensive and defensive teams. All players had to play both sides. Once a player left the field, he could not come back into the game. After graduation, the lives of the Four Horsemen took similar paths. All began coaching careers, with three of the four occupying top positions. As players, the four reunited for one game for the Hartford Blues in 1925 (Stuldreher was already playing for the team that year); the Blues, however, lost 13-6 to the Cleveland Bulldogs. Two of the four, Layden and Stuhldreher, were the namesakes of the professional Brooklyn Horsemen team for whom they played in 1926. All four players were elected to the College Football Hall of Fame — Layden in 1951, Stuhldreher in 1958, Crowley in 1966, and Miller in 1970. In 1998, the United States Postal Service honored the Four Horsemen with their own stamp as part of 15 commemorative postage stamps saluting "The Roaring Twenties" which was part of their Celebrate the Century stamp sheet series. After the Horsemen got their name, the Notre Dame line was nicknamed the "Seven Mules" to emphasize their crucial but less glamorous function. Two members of the line are also in the College Football Hall of Fame. Adam Walsh, from Hollywood, California, was the starting center and team captain. In later years, he coached at Santa Clara University and Bowdoin College and for the Cleveland/Los Angeles Rams. Walsh died in 1985. Edgar Miller was a tackle from Canton, Ohio. He later coached at the United States Naval Academy and died in 1991. 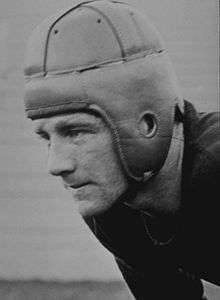 Thus, a total of six members of the 1924 Notre Dame team have been elected to the College Football Hall of Fame. 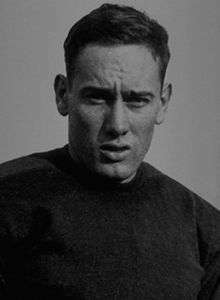 Yet another of the "Mules" was Joe Bach who went on to a coaching career that included two stints as head coach of the Pittsburgh Pirates/Steelers. Full text of Grantland Rice article from University of Notre Dame archives. ↑ Sperber, Murray A. (2002). Shake down the thunder: the creation of Notre Dame football. Indiana University Press. pp. 178–179. ISBN 978-0-253-21568-0. ↑ Carr, Richard (June 4, 1998). "1920s Sheet Celebrates The Four Horsemen And Babe Ruth". Sun-Sentinel. Retrieved October 31, 2016.